What does it mean for public sector actors to implement algorithms to make public services to be more efficient? How are these systems experienced by the families and people who face the consequences? 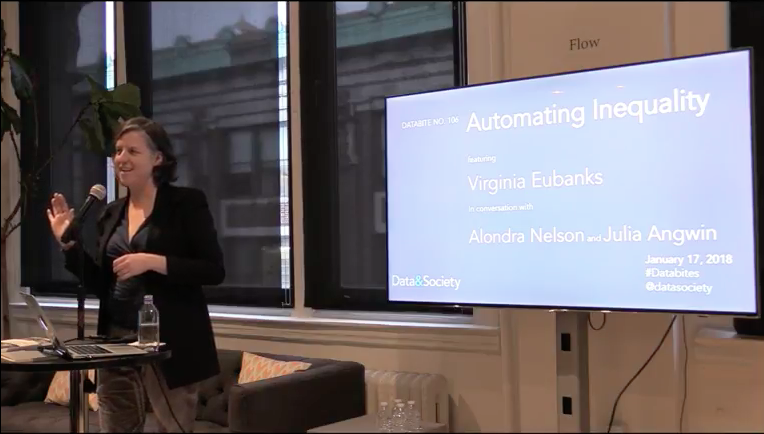 Speaking at the Data and Society Institute today is Virginia Eubanks, author of the new book Automating Inequality: How High-Tech Tools Profile, Police, and Punish the Poor. Virginia Eubanks is an Associate Professor of Political Science at the University at Albany, SUNY. Virginia is currently a founding member of the Our Data Bodies Project and a Fellow at New America. For two decades, Eubanks has worked in community technology and economic justice movements. I first met Virginia as a PHD student at the MIT Center for Civic Media, where her book Digital Dead End helped me think about the challenges of genuine empowerment through technology, and I’ve been eagerly awaiting this latest book. 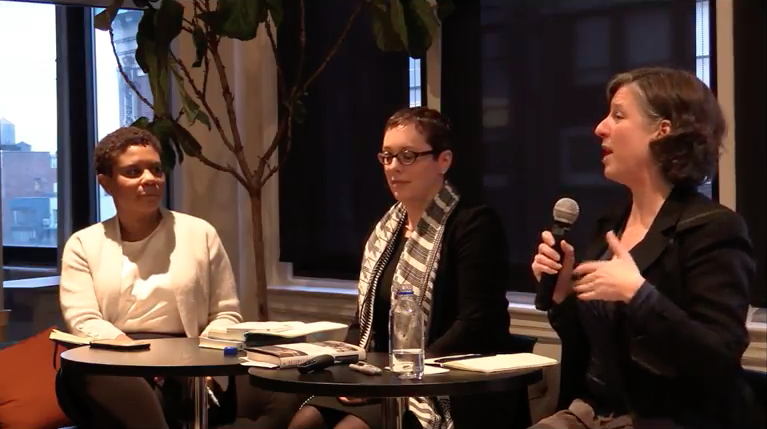 Today at the Data & Society Institute, Virginia was interviewed by Alondra Nelson, president of the Social Science Research Council, and Julia Angwin, an investigative journalist at ProPublica (watch the video here). We live in a new regime of data analytics, Virginia reminds us: a lot of really great work is thinking deeply about data-based discrimination and the role that data plays to challenge the inequities of our lives or make them worse. To study this transformation, Virginia grounds her work in history and in their political contexts. These systems didn’t fall from the sky or land on us with a blank slate. Virginia also starts by talking with people who are the targets of these systems: primarily poor and working class families across the color line– people who are often left out of the conversation. Over the last year, this has involved talking with over a hundred people across the US. How did we get from the county poorhouse of 1819 to today’s digital poorhouse? Virginia tells us about one moment in this history: the rise of this digital poorhouse. Previously, she had expected that digitization had started in the 1990s, but she realized that digital welfare records actually started in the 1960s and 1970s with the National Welfare Rights Movement. This highly successful movement, which had origins in the civil rights movement, was successful at establishing that poor Americans should enjoy the full array of constitutional rights. In the 60s and 70s, the welfare rights movement changed policies like “man-in-house” laws, “suitable home rules,” residency restrictions, and “employable mother” says Virginia. These laws expected mothers to work and barred them from public services. In the first time in history, she argues, she expanded the rights of middle class people to poor and working class people, including unmarried moms and women of color. Even as the Welfare Rights Movement became successful, the backlash against this movement coincided with a recession. Because it had become legally impossible to discriminate against people, and administrators became caught behind a rock and a hard place. They solved this problem, says Eubanks, by commissioning a massive set of digital technologies in the late 60s and early 70s. Almost immediately, we see a drop in the ability of people to access entitlements which they were due. This happened well in advance of Reagan’s “welfare queen” speech and subsequent legislation to reduce access to welfare. This effort to manage and reduce access to public services continues today, says Virginia. The state of Indiana entered into a $1.16 billion contract with IBM and ICS to automate welfare eligibility contracts. This program used computers and call-centers to manage a queue of tasks, replacing the previous case-based, family-based system focused on supporting people. This system broke relationships between case workers and people seeking access to public assistance. It’s the most straightforward disaster: a million applications were denied in the first three years, a fifty percent reduction in denials. The state broke the contract because the system went so badly, and the case is ongoing. Next, Virginia talks about the Allegheny Family Screening tool, a model used to predict children who might be victims of abuse and neglect in the future (Virginia has written about it here, the New York Times also recently published an account). In 1999, the city of Pittsburgh commissioned a data warehouse that collects data from everything from the police department to public services. In 2012, the office released a request for proposals funded by foundations, asking people to propose ways to mine the data to support public services. The grant went to a team of researchers who use statistical regression models to predict what children are going to face neglect, using 130 indicators to predict treatment. In the Pittsburgh area, when a call comes into the hotline for child abuse and neglect, the intake workers will interview the caller and make a decision based on two factors: the risk of the allegation (is it child abuse or neglect?) and how safe they feel that child is. Once they make those two decisions, they run the allegheny valley screening tool, which offers a thermometer from 1 to 20 predicting the level of risk. Based on those factors, the intake manager makes a decision about whether to screen that family through the county’s equivalent of child protective services. Virginia shares voices from people who were targets of this system. She talks about Angel and Patrick, who she meet at a family center. They didn’t stand out initially because their experiences are so average, like many working class white people. They’ve struggled with poor health, community violence, and predatory online education. Although they’re dedicated parents, they’ve racked up a history with the state. One of them failed to meet an antibiotic payment for their daughter. Several times, they had an anonymous tipster call investigators, who investigated them and cleared them. But each of those cases was recorded. The family is now terrified that the algorithm will label them as a risk to their children: they live in fear that someone will see their daughter outside, pick her up, and say that she can’t live with her parents anymore. Some of this system’s are ones we would expect as statisticians. The data is limited, it only includes public records, and it doesn’t track whether someone received help from private services. Yet the designers of this system have carried out all of the best practices. The design of this tool was participatory, the researchers have been transparent about everything except the weights of the predictive variables, and the algorithm is publicly owned and controlled through democratic processes. Virginia closes by asking us: how do we respond to systems that were designed using good practices that nonetheless represent a dangerous risk to working people, systems that police, profile, and punish the poor? Julia opens up by mentioning an argument that she often has with her husband, who does work on international development. Many days, he often talks about new kinds of surveillance that could improve the lives of the poor. To serve the poor well, you need to know the data that they need. For example, he used aerial photography to figure out where all the schools in Nigeria there were– which they didn’t exactly know before and which might genuienly support the poor. But at the same time, it’s surveillance. Accessing public services is incredibly different, says Virginia, and if we can lower the barrier, that’s an incredibly possible thing. Right now, anyone who wants public assistance needs to go to many, many offices and forms. Many public assistance budgets have a line called “diversion” which is money spent by the state to reduce the number of people who access what is theirs by law. While streamlining these systems can be beneficial, people sometimes need to reduce their visibility to these systems in order to survive. When public services integrate, you become hyper-visible, which creates great harm for people, says Virginia. Surveillance systems can involve people in a cycle that can criminalize them very quickly (JNM note: for things like missing an appointment or ticking the wrong box). Evidence is great, says Virginia, and it can help us find out what works. But evidence can be used to persecute. We should always be thinking about both of those things. Alondra remarks that Virginia’s book offers a powerful example of how to ask the important questions about algorithms. Wonkish people tend to look more and more closely at the algorithms, when we could also just step back and look at how these systems affect people’s lives. Julia asks about the idea of “the deserving poor,” where so much technology has been designed to try to make decisions about who is deserving and who isn’t. How can we find a way, she asks, to talk about problems that have collective harms eve when we can’t find the perfect case of injustice? Editors and storytellers often want the “perfect victim” in order to make the story relatable. How do we escape this trap? Virginia response that people often expect that the welfare system has been designed to ensure that people get the benefits they deserve under the law. In reality, we keep on re-inventing systems that try to decide whether someone’s responsible for their poverty and avoiding supporting them. Two thirds of Americans, says Virginia, will access some kind of means-tested public service in our lifetimes, but many of us fail to admit that we’ve needed these services. And since we don’t admit that we’ve accessed these systems, we never get around to organizing to ensure that we are served effectively. To create change, says Virginia, we need people to understand how these systems affect us all, organize social movements, and also to re-imagine how we expect technologies to support the poor. She hopes that the book will help people recognize that we have a shared struggle whoever we are. Julia Angwin asks about movements like the Poor People’s Campaign, the health clinics provided by the Black Panthers, and the work done by the Panthers on sickle cell anemia (see Alondra’s book Body and Soul). Alondra responds that if you’re poor, you’re stigmatized. If you’re black, you’re stigmatized. The category of “deserving poor” does not exist for those who accept the definition. Social movements often offer us meaningful examples, says Alondra, because they look to the future. To make that work, communities need cohorts of experts who support communities and movements to shape their own futures. Virginia talks about the idea of organizing communities to review, critique, and optimizing how to interact with the forms to maximize access to rights and public services within the law. Virginia mentions the Our Data Bodies project, which talks to marginalized neighborhoods about the collection, storage, and sharing of their data by government. The purpose of the movement is to help people understand what they’re facing, confirming some of their fears, and also helping them manage their “data self defense.” People have brilliant strategies for survival, self-defense, and community defense, says Virginia. The project will be sharing initial results in March.